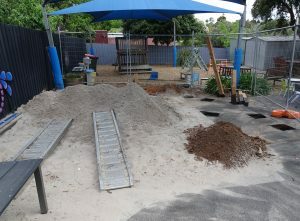 We are very excited to share the upgrade to the sandpit at GEKA Murrumbeena Kindergarten! 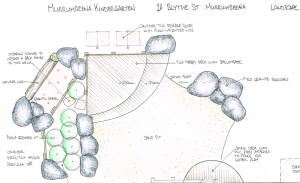 This $22,000 project, designed and developed by BV Landscapes, will have a multitude of benefits for children, including interaction with the natural environment as well as enhancing a sense of wellbeing. 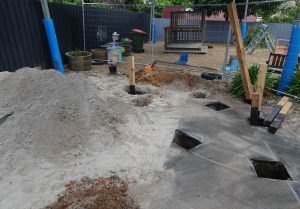 A good quality sandpit, according to the National Standards for high quality Education and Care (2017), should provide children with opportunities to explore and experience the natural environment. By fostering children’s capacity to understand how to respectfully engage with the natural environment, educators are able to create learning spaces that encourage children to explore, problem solve, create and construct in challenging and safe ways. Sensory materials, such as sand, provide the added benefits of creating a calm and relaxed environment. A strong sense of wellbeing, provides children with confidence and optimism which maximise their learning potential. It encourages the development of children’s innate exploratory drive, a sense of agency and a desire to interact with responsive others. Wellbeing has a direct link to resilience, providing children with the capacity to cope with day-to day stress and challenges. Above all else, being immersed in the sandpit with a group of friends is a whole lot of fun! We certainly cannot wait to see the end result!